5 Lesbians Eating a Quiche is a comedy with a twist and a “frolicsome little play that ventures into heady excesses of absurdism” (NY Times). 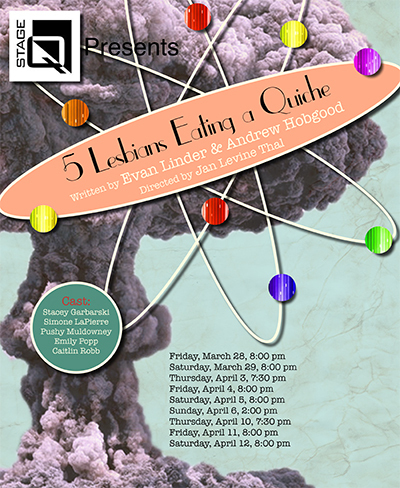 A dark comedy set in 1956 amid the threat of nuclear war, this play harpoons many of the mid-century myths and assumptions that pushed lesbians into the closet – or into the kitchen to bake quiche. Both men and women are invited to join the antics of the “widows” who worship the Egg in their Susan B. Anthony Society for the Sisters of Gertrude Stein. The talented cast includes: Stacey Garbarski, Simone LaPierre, Pushy Muldowney, Emily Popp, Caitlin Robb and Clarice Lafayette. They will be joined for Talkbacks lead by Dramaturg James Clayton, Linda Lenzke, Director Jan Levine Thal, Donna Peckett, and others after some of the performances. Tickets are $15. for Thursday evenings, $10 for Sunday matinees and $20 for Friday and Saturday evenings. Tickets are available via a link at www.stageq.com or by calling 608-661-9696.